Welcome home! 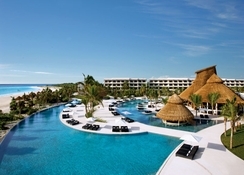 That's the greeting that awaits as you step in to the vast lobby area of Secrets Maroma Beach Riviera Cancun, an unlimited all-inclusive adults-only luxury resort. 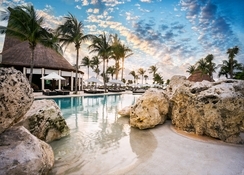 With beach and pool waiter service, a huge array of dining options, premium branded drinks and a world-class spa you will feel both spoilt and indulged as you unwind, relax and savour this popular resort. The beach has also been voted the world's best by a popular travel channel for years in a row so you can be guaranteed that the fine white powdery-soft sand is as stunning as the views of the Caribbean Sea beyond it. Secrets Maroma Beach Riviera Cancun is located on Maroma Beach in Riviera Cancun, 40km away is Cancun International Airport, approximately 30 minutes’ drive. 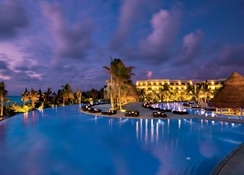 Cancun’s Party Zone can be reached by a 30 minutes’ drive from Secretes Maroma, and Playa del Carmen is a 15-minute drive away. Tulum Archaeological Site is 50 minutes’ drive away. Offering luxe accommodation amidst a scenic setting, Secrets Maroma Beach Riviera Cancun has 412 luxurious and non-smoking guest suites, which come with four-poster canopy king-size or double beds private balcony/terrace, en-suite bathrooms with bathrobes, toiletries and a hairdryer, in-suite hydro tub, mini-bar, flat-screen satellite TV, DVD player, an iPod docking station and much more. 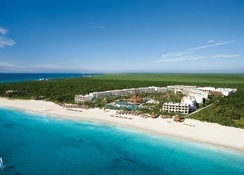 There are nine reservation-free restaurants to choose between at Secrets Maroma Beach Riviera Cancun. World Café is the hotel's main buffet restaurant, open for breakfast between 7:30am and 11am, lunch between 12 noon and 3pm and dinner serving international cuisine between 6:30pm and 11pm. 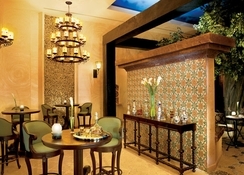 Portofino is an Italian restaurant open for dinner between 6pm and 11pm. El Patio serves authentic Mexican favourites open for dinner between 6pm and 11pm. Oceana is a specialist seafood restaurant open for dinner between 6:30pm and 11pm. 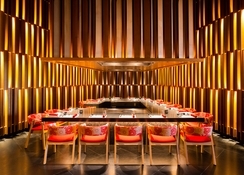 Himitsu is an Asian fusion and Teppenyaki restaurant open for dinner between 6pm and 11pm. Bordeaux is a fine French restaurant open for dinner between 6pm and 11pm. Seaside Grill is a speciality steak and grill restaurant open for dinner between 6:30pm and 11pm. Barefoot Grill serves lunch snacks between 12 noon and 4pm. Coco Café is a speciality coffee shop serving snacks between 8am and 10pm. 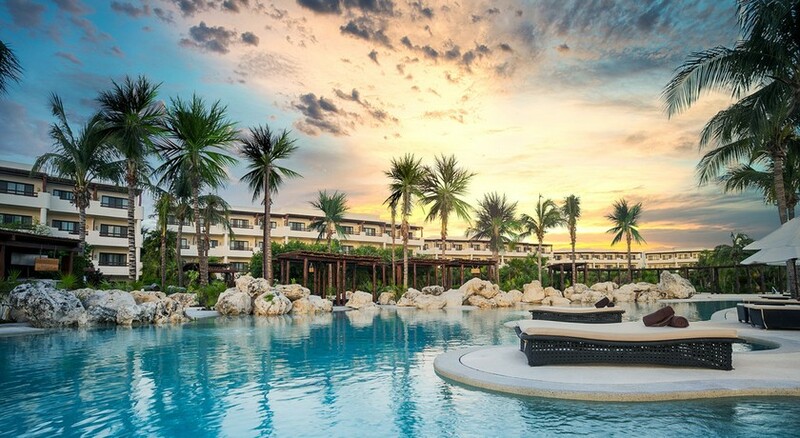 13 swimming pools including an infinity pool with views overlooking the Caribbean Sea await guests at Secrets Maroma Beach Riviera Cancun. Jacuzzis, fully equipped fitness centre and Secrets Spa by Pevonia with sauna, steam room, Jacuzzi and hydrotherapy pools, offering a range of treatments and therapies at an extra charge. There are two tennis courts, mini-golf course, basketball court, volleyball court, and facilities for water aerobics, beach and pool volleyball, Euro-bungee, archery, yoga, batting cage, bocce ball, football. Non-motorised water sports including sailing, kayaks, Hobie Cats and snorkelling. Cocktail, cooking and dance lessons are there for recreation of guests. Big-screen movies on the beach, open-air theatre with regular evening entertainment including live music and theme nights ensure there’s never a dull time.